Despite what you may have heard on the Fox network, Neil Armstrong did walk on the moon on July 20, 1969, and not in some television studio mock-up as some people would like you to believe. However, what many people might not realize was that this historic event might not have been seen on televisions around the world had it not been for the tireless efforts of the Parkes Observatory in Australia. 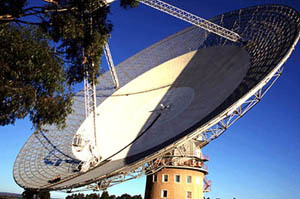 The largest radio telescope in the southern hemisphere (which is incidentally located in the middle of a sheep paddock), the Parkes Observatory was chosen by NASA in 1968 to be the prime receiving station for telemetry and television signals for the Apollo 11 mission. ... which was when the Parkes crew ran into the second problem-- high winds. The area was suddenly buffeted by 65 mph winds, the stress from which threatened to tear the radio telescope apart. Fortunately, as the first images from the moon began to beam back to Earth, the winds died down and the Parkes Observatory was able to fulfill its historic duty to the citizens of Earth. The Australian comedy "The Dish" is based loosely (my guess would be 'very loosely') on these events, and was an audience favorite at last year's Toronto International Film Festival, where it came in second place for the People's Choice Award, losing only to "Crouching Tiger, Hidden Dragon". At the center of the story is the widowed scientist in charge of the Parkes Observatory, Cliff Buxton (Sam Neill, who will be appearing in "Jurassic Park III" this summer), who must smooth the waters between his assistants, Glenn (Tom Long) and Mitch (Kevin Harrington), and the no-nonsense observer sent by NASA (Patrick Warburton of "Scream 3"). In the periphery are a number of other colorful characters, including Mayor Bob McIntyre (Roy Billing) and his wife Maisie (Genevieve Mooy), who are trying to make everything perfect for the event; their sullen teen daughter (Lenka Kripac) who never seems to have anything pleasant to say; a clueless security guard named Rudi (Taylor Kane) in charge of watching the observatory; and his sister Janine (Eliza Szonert), who secretly holds a flame for Glenn. 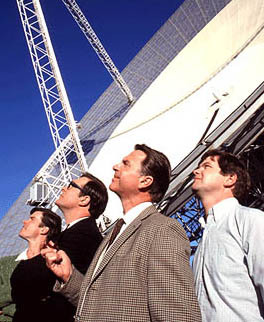 Weaving between the main story and the subplots, it is quite clear the point being made: similar to how the Apollo 11 mission embodies the aspirations of all mankind, the role that Parkes plays in relaying the televised images also serves as a chance for all the townspeople to each have a shining moment, which they do. "The Dish" is the work of director Rob Sitch, who made a splash in 1997 with the hysterical "The Castle". Even though the outcome of the story is obvious, Sitch manages to engage his audience with fast and friendly humor, most of it arising from the cast of likable (and sometimes quirky) characters that inhabit Parkes. If you have found your senses dulled by the incessant use of toilet humor in American comedies, you will find "The Dish" incredibly refreshing. It is difficult to say what would be the film's funniest bits, since there are so many great ones to choose from. The most memorable moments that come to mind would include Cliff and his team losing the signal from Apollo 11 (and then improvising 'radio communication' with Neil Armstrong to impress the visiting US ambassador), the school band's hilarious fumble in playing the American national anthem, Harrington's wonderfully off-the-wall portrayal of the cynical Mitch, and Rudi's farcical attempts at guarding the observatory's perimeter. "The Dish" is the kind of film I would have no qualms in recommending, even to those moviegoers who typically would not embrace 'foreign films'. 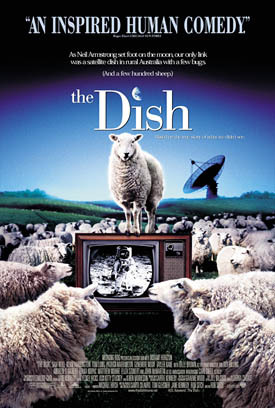 Like most Australian comedies that are able to find distribution in North America, "The Dish" is a delightful and inspiring character-driven comedy that is sure to please anyone, and perhaps one of the more memorable films of 2001.